He also made a surprise appearance on the campaign trail on Friday. While President Donald Trump's former national security adviser Michael Flynn awaits sentencing for lying to FBI agents about his contacts with Russian officials, the retired three-star Army general has been quietly "putting his life back together," surfing and even dabbling in politics, friends and relatives say. Flynn has kept a low profile for more than three months following the dramatic court appearance in which he made what confidants call a humiliating admission for a soldier with a decorated 33-year military career. He has avoided the news media and even moved to shut down a conservative lobbyist’s unauthorized public fundraising event for his legal defense fund. "He felt he needed to act as a soldier and has kept his mouth shut," a close confidant told ABC News. "He doesn't want to be viewed as whiner." But in a move that stunned some supporters, Flynn returned to the spotlight on Friday night, appearing beside Omar Navarro, a Republican who is running against Democratic stalwart Rep. Maxine Waters in California’s 43rd Congressional District and has already collected endorsements from a trio of political celebrities: GOP consultant Roger Stone, Infowars' Alex Jones and former Arizona Sheriff Joe Arpaio. “What I'm not here to do, is I'm not here to complain about who has done me wrong, or how unfair I've been treated or how unfair the entire process has been,” Flynn said to laughter from supporters as he introduced Navarro at the rally. “You know, it is what it is." While a far cry from his infamous "Lock her up!" speech at the 2016 Republican National Convention, Flynn’s appearance at a political rally raised eyebrows among some of Flynn’s supporters, who believe he should have avoided an event that did little to help his public image. 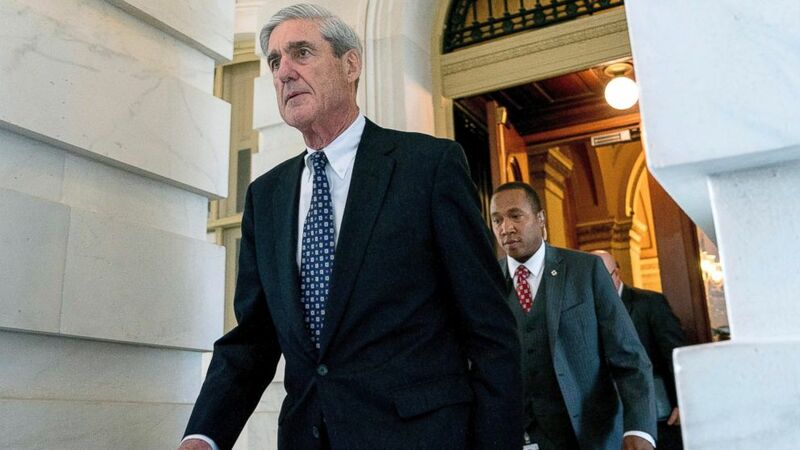 (Andrew Harnik/AP, FILE) In this June 21, 2017, file photo, former FBI Director Robert Mueller, the special counsel probing Russian interference in the 2016 election, departs Capitol Hill following a closed door meeting in Washington. Flynn's lawyer Robert Kelner did not respond to an ABC News request for comment on the Friday campaign appearance. Navarro told ABC News that he did not pay Flynn “directly or indirectly” to speak or cover his travel expenses from Rhode Island, but his closest supporters say carefully raising his public profile again is key to his ability to earn income. Flynn is selling his Old Town Alexandria townhouse for about $835,000 to pay steep legal fees amassed over the past ten months since Robert Mueller was appointed special counsel to probe alleged collusion between the Trump campaign and Russian agents. Friends and family say he’d like to get back to doing some sort of "foreign policy" consulting, but it's not apparent whether he has actively sought or accepted any such work. Out of public view, Flynn has been focused mostly on grappling with a year of personal turmoil since President Trump dismissed him after 24 days as his national security adviser. Recent photos shared on social media by family members show Flynn surfing frigid waves off the New England coast in a body suit. "What he's doing is putting his life back together and looking forward," his brother Joe Flynn told ABC News. Many of his supporters do not believe that he did, in fact, lie to the FBI when agents visited the White House 14 months ago to question him about contacts he had with the Russian ambassador during the transition following the November 2016 election. His younger brother Joe also rejects the idea that his sibling would ever do anything dishonorable. "There is nothing he would ever do willfully to harm the United States,” Joe Flynn told ABC News. Why Flynn pleaded guilty to one count of lying to FBI agents and agreed to be a cooperating witness as part of a plea to avoid a trial -- if he was actually innocent, as his supporters maintain -- has so far not been explained. (Eduardo Munoz Alvarez/AFP via Getty Images, FILE) In this file photo dated Nov. 17, 2016, Michael Flynn Jr. is seen behind his father, retired Lt. Gen. Michael Flynn, as they arrive at Trump Tower in New York City. 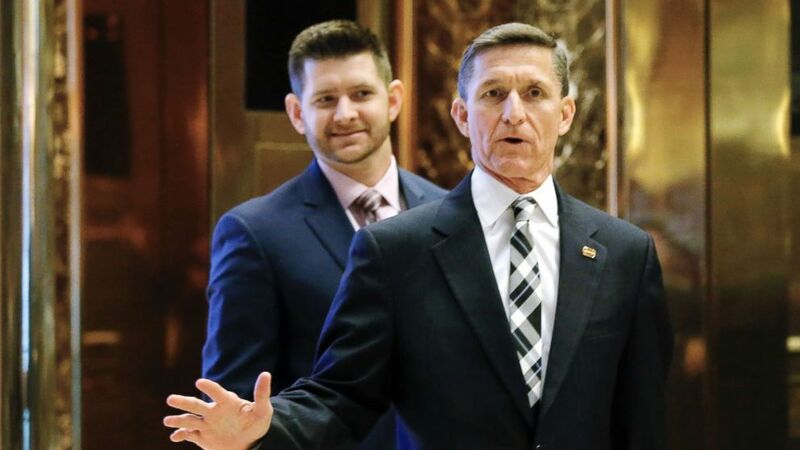 A popular belief pushed by some conservative supporters is that he pleaded guilty to protect his outspoken son Michael Flynn Jr. from facing unspecified charges related to his role in the now-shuttered Flynn Intel Group lobbying firm. Mueller's team reportedly threatened to indict his son, according to the Washington Post, but sources close to the family say even the Flynn family is in the dark about what prosecutors actually did or did not have on Flynn Jr.
For one thing, until former Trump campaign manager Paul Manafort was charged by Mueller, it was very rare for anyone to be prosecuted under the Foreign Agents Registration Act, which is one law Mueller looked at as he examined Flynn’s work for entities tied to the Turkish government. A month before his father’s surprise guilty plea, Michael Flynn Jr. tweeted, “The disappointment on your faces when I don’t go to jail will be worth all your harassment.” Flynn’s son has not been charged with any crime. Friends and family members have discussed a social media effort to build public support for somehow reversing the disgrace of a felony conviction. They have pushed the hashtag #ClearFlynnNow, which Joe Flynn says has gained some traction on Twitter. But given the iron-clad language of his plea agreement, even diehard supporters in the retired general’s orbit concede privately it will be tough to walk back Flynn’s guilty plea. It is also unclear how he is helping the Mueller investigation. Some supporters are holding out hope that the Justice Department inspector general’s report due to be released possibly next month — which sank FBI Deputy Director Andrew McCabe on Friday when he was fired by Attorney General Jeff Sessions 26 hours before his effective retirement date — will somehow offer exculpatory evidence of FBI misconduct that will compel the judge to let Flynn off the hook. Trump could also pardon Flynn at any time, but his lawyer and family have not said if he has asked the White House to do so. ABC News’ Emily Goodin contributed to this report.